Writing Our Stories (WOS) branched out into a public school this year when Columbiana Middle School (CMS) adopted the flagship program of the Alabama Writers’ Forum for the Spring 2011 semester. 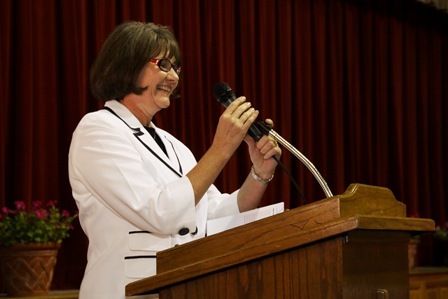 The Forum worked with Terri Sullivan and the Shelby County Arts Council to bring WOS to the Shelby County School District. 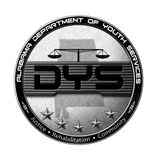 This residency was the program’s first partnership with an Alabama public school outside of the Alabama Department of Youth Services (DYS) school system. Tony Crunk, veteran WOS teaching writer at the DYS Vacca campus, worked with Maite Miller, certified substitute teacher Katherine Jarnigan, and some forty-five students in two sections of Miller’s seventh grade reading class. Crunk met with students twice a week through April. 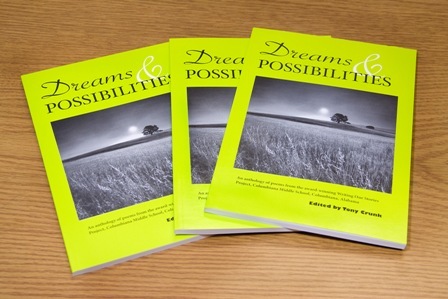 During Honors Day on May 25, CMS recognized the newly published authors and the release of Dreams & Possibilities, their anthology of original poems and stories. Writing Our Stories is an award-winning creative writing collaborative program whose partners include DYS, the ABSOP project, and the Forum. 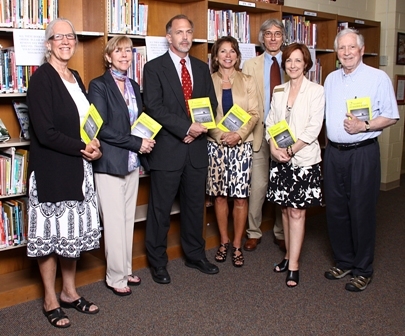 The Children’s Trust Fund provided funds for the WOS Curriculum Guide. 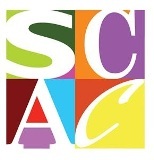 The Alabama State Council on the Arts provides operating support to the Alabama Writers’ Forum. Additional support for WOS at CMS was provided by the Alabama State Council on the Arts, the Alabama License Tag Grant Program, and the Shelby County Arts Council. 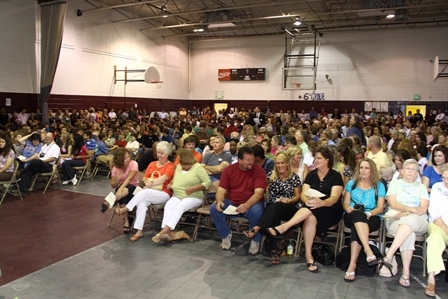 Parents and guests assemble for CMS Honors Day and the launch of Dreams & Possibilities. 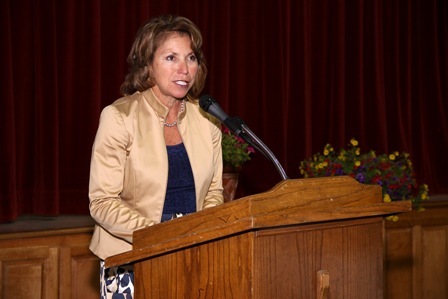 CMS principal Christie Muehlbauer welcomes the assembly. Terri Sullivan, Shelby County Arts Council founder, president of the board, and volunteer interim executive director, offers some remarks. 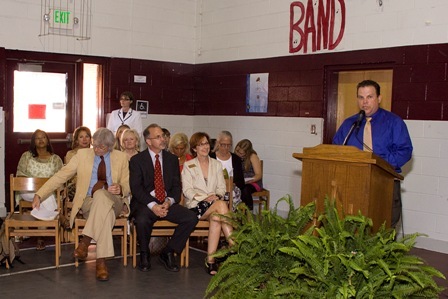 CMS teacher Richard Scott addresses the audience. Diana Green, Alabama State Council on the Arts, Arts in Education Program manager; Sharon DeVaney-Lovinguth, Instructor of English, Distance Education Division, Jefferson State Community College; Marlin Barton, AWF assistant director for Writing Our Stories; Terri Sullivan, Shelby County Arts Council founder, president of the board, and volunteer interim executive director; Tony Crunk, teaching writer; Jeanie Thompson, AWF executive director; & Bob Whetstone, Alabama Humanities Foundation board member. 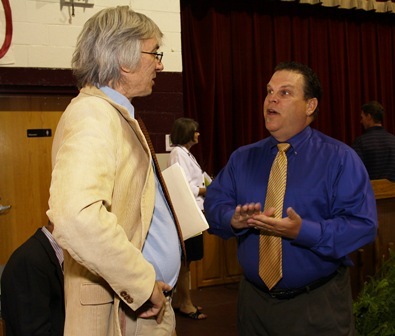 WOS teaching writer Tony Crunk and CMS teacher Richard Scott discuss the event. 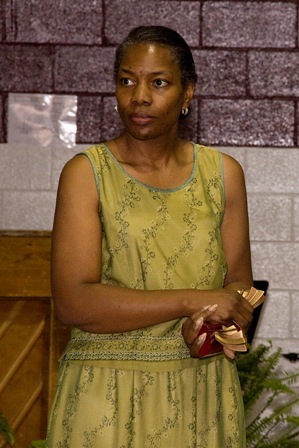 CMS librarian Sheila Blount listens to remarks. 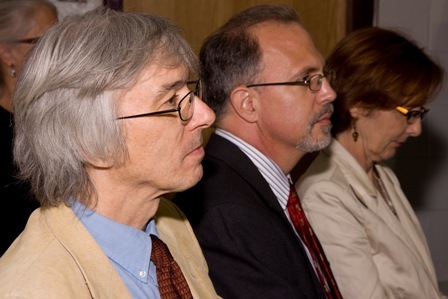 WOS teaching writers Tony Crunk and Marlin Barton and AWF executive director Jeanie Thompson listen to the remarks. 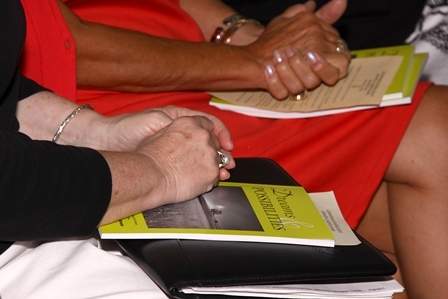 Audience members hold copies of Dreams & Possibilities.